Summary: Many people associate Marcy with high end weight / resistance training equipment. While this company built their excellent reputation there, they also make popular fitness machines including the Marcy Foldable Magnetic Rower. 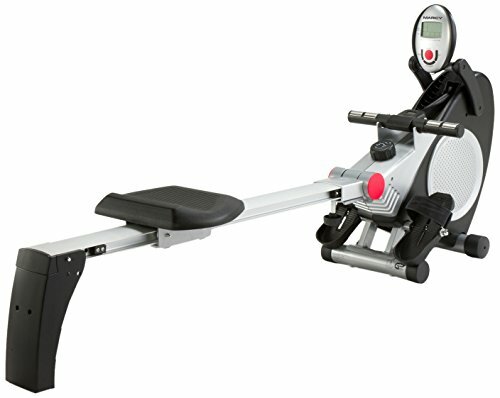 This is a sturdy rowing machine, which comes in at the lower end of the price range. It has a hand pulse sensor, and 8 resistance levels. It is sturdy enough to cope with bigger users. This type of rowing machine will suit those starting on the road to fitness – while it is not commercial gym spec, you’ll get a solid, reliable machine for your money which also folds up when not in use. Check the amazon.co.uk product page for the spec and full picture gallery. The first thing you’ll notice about this rower is the double-footed design of the base. This is typical of Marcy, who build a lot of resistance / weight training equipment. This will help ensure that your rower stays in place. This is a mid-sized machine, weighing in at 32kgs. It is 183cms long and 79cms tall at the top of the display. It folds (pivots) close to the base, which is great for getting it out of the way. As with all rowing machines, I do recommend you get it together with a rubber mat. This will save wear on your floor and keep the noise levels down too. The max user weight is 120kgs, which is close to 19 stone. You’ll find comments from buyers over 6 feet tall saying they were comfortable using this unit. It comes with a 2-year warranty. Smooth and predictable resistance is provided at 8 levels. There is a 4-kg fly wheel, and a dial which you can easily twist to raise or lower the resistance during a session. You can track your progress on an LCD display. This covers all the usual factors including strokes, time, distance and calories. In addition, there is a pulse sensor on the hand-grip. Calorie counts are always approximations on this type of equipment – though seeing that number go up can still be great motivation to push a little harder! Some assembly is needed, though according to comments from buyers this was minimal. There are wheels on the base of the main unit to help move your rower around. What Previous Buyers Said about the Marcy Foldable Rowing Machine? As usual, I digest all the comments and try to come up with themes which sum a piece of fitness equipment up. Here the word ‘sturdy’ shines through. This is a key factor with a rowing machine, and does not surprise me after knowing how Marcy work with weight training equipment. The Marcy Foldable Magnetic Rower is a budget level rowing machine, and as usual some commenters do compare it unfavourably with what they got used to in a commercial gym environment. This is normal enough, though you will never be satisfied by comparing kit to units which cost 10x as much. At the time of writing the feedback was positive enough (given the lower price) to give this item a Fitness Review ‘thumbs up!’. Wrapping Up: Who Would Enjoy the Marcy Foldable Magnetic Rower? Two types of people would benefit most from this. First, those who are rushed for time, for example looking for an alternative to a longer run for a quick cardio fix. Second, people who would like to start on the road to a healthy lifestyle. A rowing machine like the Marcy Foldable will give you an all-over cardio workout, and has the flexibility to start gently – then go up to a vigorous session at the higher resistance levels. That would be the low price for the quality. Check out the gallery, and check the comments from previous buyers for yourself now on this dedicated amazon.co.uk product page.